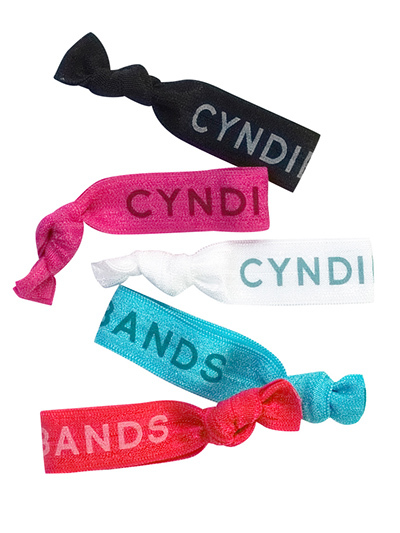 We have a number of options for printing on Cyndibands hair ties based on quantity, colors, and turnaround time. Our lowest minimum (100 hair ties) and quickest turnaround (1-2 weeks) for custom printed hair ties is available when printing a single color repeating logo on white elastic. If you would like your logo or text printed on a color (non-white) hair tie then the order minimum is 300 hair ties and we have a number of stock colors available for you to choose from. If you are able to order a minimum of 3,000 hair ties in a single color, with the same logo, and have 4-6 weeks, then we can offer custom dyed elastic to match your brand or event at our lowest per unit price. Email us the following information to get started creating your custom hair ties. Date Required? Are these for an event? Logo, text or no-logo hair ties? Loose hair ties or with packaging? Color of logo or text? Copy of logo. If you would like a proof then please send .eps or .ai version. Print your logo or custom text on our knotted ribbon elastic Cyndibands hair ties. This popular promotional item is perfect for your brand, event, school, business, or celebration. Knotted elastic can be worn as hair ties or bracelets. Give all attendees a matching bracelet that is comfortable, unique and memorable. Cyndibands customized products have been used at events such as New York Fashion Week, Beautycon, school fundraisers, store openings, 5K races, Susan G. Comen Race for the Cure, product launches, wedding and party favors, tradeshow giveaways, sorority and greek recruitment, hackathons, app launches, bridesmaids gifts, bachelorette parties, swag bags, and private label products. We have created custom Cyndibands hair ties for hair and makeup beauty brands, salons, schools, churches, non-profits, teams, and fitness brands including yoga studios, personal trainers, pilates, barre studios, and gyms. Fast turnaround times and responses to all questions. Good product at a reasonable price. Everyone loves these bands, great swag that will put your brand name in people's heads every day. What's not to love? Big fan and will be a repeat customer. Guys, I just have to say that I have never worked with a nicer, easier and more caring company. Everything was done so fast. Everything was done exactly how we wanted it, and the people were so incredibly nice. I personally spoke to Liz, and she was just so helpful, so kind and really grasped what I wanted. I called a couple of companies before, and they really just wanted your business and that's it. This company wants you to be happy and makes sure you get exactly what you want. I wish I could give 10 stars! Seriously best best best ever!!!! We LOVE our hair ties! We used these hair ties recently at the Active Collective Trade Show and they were a big hit with the buyers. I will be ordering more soon. They are my new favorite give away!